Advanced Energy Materials, LLC (ADEM) is a leader in bulk manufacturing of nanomaterials and developed a variety of nanowire based materials. ADEM’s expertise lies in the synthesis of variety of nanomaterials including nanowires, nanoparticles, and mixed metal alloy nanoparticles with tunable compositions. ADEM has the ability to manufacture a variety of nanomaterials from kilograms to tons scale, depending on the application and requirements. ADEM has extensive experience in manufacturing metal oxide nanowires using its two distinct and patented technologies: Direct Oxidation synthesis of metal to metal oxide nanowires at below or near melting point temperatures, and Solvo-Plasma™ oxidation of metal oxide nanowires using alkali metals that require high melting points. 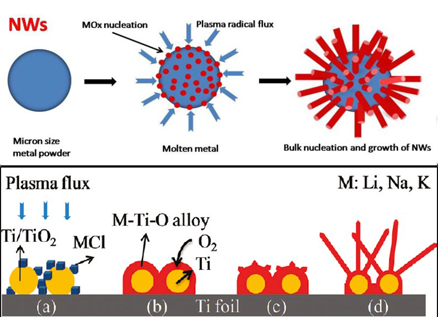 The oxidation method is a dry manufacturing process that involves direct exposure of molten metals to microwave plasma-excited gas or hydrocarbon flame in a fluidized bed reactor resulting in oxide nanowires. The role of plasma activation here is to enable rapid dissolution of solutes such as oxygen and keeping the surface of molten metals clean. Growth condition needs to be maintained near the melting points of metal, which preferentially support growth in one dimension ensuring that metal remains in molten condition during the process. ADEM uses a unique mechanism to produce metal oxide nanowires directly in gas phase from respective metal powders. This patented scale-up process has been developed by ADEM from bench scale to pre-commercial scale. The scheme is implemented in an upstream atmospheric plasma flame fluidized reactor, in which micron-scale metal powders are fed into the reactor. The metal powders melt and oxidize to form high densities of metal oxide nanowires during their residence in flight. The resulting nanowire powders are collected under the cyclone and the bag house filter. This new reactor has been successfully implemented for bulk production of half a ton per day quantities of ZnO nanowires at its manufacturing facility. ADEM's dry manufacturing technique completely removes an expensive process for handling any liquid and secondary toxic waste, making it extremely cost-effective. 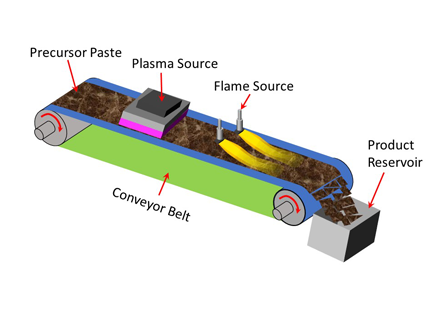 The Solvo-Plasma method is based on atmospheric plasma or thermal oxidation of metals or metal oxides in the presence of alkali reagent for producing metal oxide nanowires and porous metal oxides. This concept can be employed in a wide range of material systems. Plasma oxidation allows for ultrafast timescales (minutes) compared to conventional hydrothermal oxidation using large quantities of water. This method has been demonstrated with the synthesis of TiO2, Co3O4, Mn3O4 and WO3 nanowires as oxides of high melting point metals and SnO2, ZnO as oxides of low melting point metals. ADEM has also demonstrated this method with ternary oxides of lithium tungstate, lithium titanate, lithium aluminate, lithium orthosilicate, potassium titanate and potassium stannate.